Dubai: The Cartoon Art Gallery will be showcasing the exclusive collection of “Smile of a Woman around the World” by Isabelle Noor a French resident Artist from Dubai. The show opens at 5:00pm on Saturday 12th of November till 17th of November inaugurated by the honorable Bernard Frontero – Director of Alliance Francais Dubai, UAE. The exhibition will include 29 Artworks depicting women who represent humanity, cultural treasures, heritage, historical inspirations. The project was conceptualized in 2014 and came to being, after the Artist was inspired to tell stories of women and peace. As she began working, each painting was complied along with an authentic photograph, which was taken, by Isabelle and her sister during their travels. The regions represented in this project are Jordan, UAE, Oman, Burma, Indonesia, Mali, Kenya, Switzerland, India and Thailand. Each painting is a picture documentary, including the landscape of that nation; current news clippings from the country and the ladies are named after common names from the corresponding countries. A French Artist painter, now resident in the UAE, with a promising career as an interior designer, she chose, instead, a life of pure creative expression. 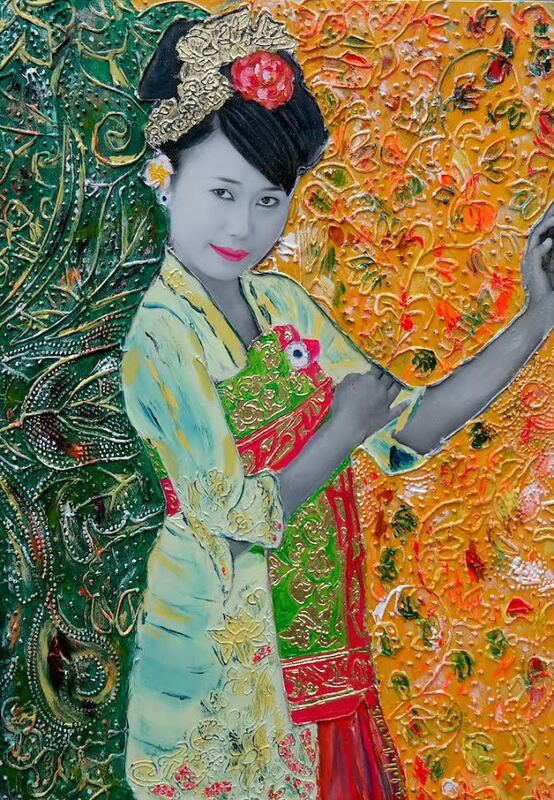 Much of her inspirations for her stunning mixed media work stems from her immersion in the cultural richness of non-Eastern-locales. Currently, she completed the final stages of a major exhibit, three years in the making: “Smile of a Woman around the World.” This loving tribute to the beauty of women of all nationalities is a message of compassion, hope and friendship between nations. In the depth of her creative passion, in the wellspring of a creativity that transcends artistic media as it soars beyond cultural bounds, Isabelle Noor stands as a unique talent as well as a profound celebrant of the resilient heart and the soaring human spirit.